Oscar Wilde's greatest play maintains its position as one of the funniest and most often performed plays in the English language. It is a farce and a romantic comedy of manners and satire on Victorian society. Wilde peoples his world with merciless caricatures of the society in which he lived and worked. Lady Bracknell, the formidable son-in-law hunting dragon; Gwendolyn, her vacuous but business-minded daughter whose suitor, Jack Worthing (aka Earnest) was found in a handbag; Algernon, Jack's young wastrel friend who gets in the most awful scrapes; Cecily Cardew, Jack's spoilt ward; Miss Prism, her governess and Dr Chasuble the confused but well meaning vicar. 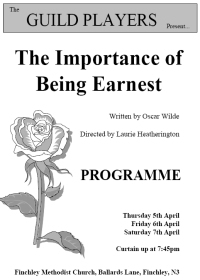 It is always a challenge to amateur groups to breath new life into such well known pieces as Oscar Wilde's consumate classic The Importance of Being Earnest. It is not hard for those of us in the audience to almost hear breath being held around us as those famous lines wind their way towards us. The question to any group accepting this challenge is how to make these moments become new experiences. The Guild Players accepted this challenge and came a long way to pulling it off. The style and pace of the production were commendable.The stage setting, a series of frameworks onto and around which basic furniture and props were assembled, worked well and gave a great deal of flexibility to Director Laurie Heatherington which he used with some imagination. The casting, if somewhat predictable, still gave us quite believable people in the well known roles. Algy (Nick Johnson) and Jack (Spencer Clayton) were a fine foil for one another. My only criticism of these two excellent actors is the speed with which they delivered some of those precious lines, particularly in the first act. A little less speed would have meant a little more pace. Surely every actress must want to play Lady Bracknell at some point in her career. It is such a gift of a part for the 'right' person. Too often our view of what this lady is, how she looks and how she behaves is conditioned by the famous way in which the line ' a handbag?' is delivered. Margaret Johnson decided to put her own spin on the part, clearly drawing from those well known interpretations. She ruled the stage with her presence and was as intimidating, arch and scheming as she needed to be to ensure the bright future of her niece Gwendolen). Again, the Guild Players were fortunate in having the right combination of actresses in Liz Pumphrey (Gwendolen) and Jennifer Lewis (Cecily) to bring to us the clear differences in their upbringing and behavior that Wilde intended. The other duo of Canon Chasuble and Miss Prism were competently and amusing portrayed by Guild Player Stalwarts Bill Davey and Sally Martin. Ren� Butler was Lane the Manservant and Paul Sparks was Merriman the Butler both contributing to the pace and delivery of the production, although what the footman (Mike Sparks) was doing in his brief appearance I am not certain. A particular mention should be made of the excellent costumes. All seemed right for the period. All in all a very creditable production of this timeless classic.